Since gold's bull run began a decade ago, many people have asked me whether the metal was in a bubble, despite the fact that there were many drivers in place for gold. Here's another comparison – shown in the chart below – that answers this classic question. Research firm Commerzbank's strategists recently compared the price of gold starting in 2002 to the price of Brent crude oil starting in 1998 and the NASDAQ Composite from 1990. Immediately following each index's record highs, oil and tech stocks declined sharply. Within nine months, tech stocks had halved in price, while it took only three months for oil to lose half its price, says Commerzbank. You can see the dramatic rise and fall of each index on the chart below. 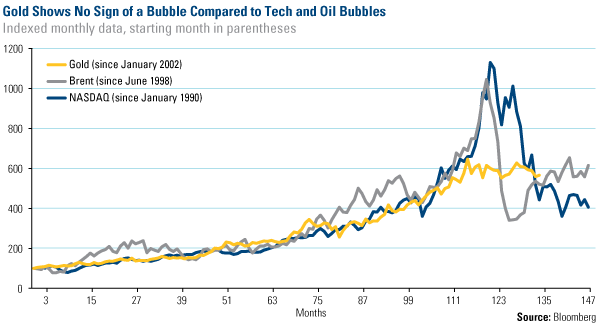 In contrast to oil and tech, gold has been level-headed over the past decade. Nearly 20 months after its peak, gold has fallen only about 25%, and its path remains in line with Brent and the NASDAQ after their bubbles burst. In Commerzbank's opinion, a comparison between the current situation in gold and the former bubbles is superfluous at best. I'm tired of the "Bubble" word. The Chinese and Russia's ain't daft they know the dollar is doomed, but can't dump all of their dollars onto the market at once as this will collapse the dollar …given that 98% of their reserves are I. Dollars they will keep buying all be it carefully and secretly….for many a year…. Just look at history all fiat currencies have lasted for 100 years or less before they are changed from what they original value was….the dollar as we know it doesn't have many years to go…. Gold prices can certainly increase from today’s opening price although I would be hard pressed to find many analysts who agree. In today’s economic and political climate I believe higher gold prices are inevitable and due to the recent recovery gold has seen I believe that many investors of gold probably agree also. Frank Holmes is no expert, he's a one-way gold bug blowing his own horn Bill.